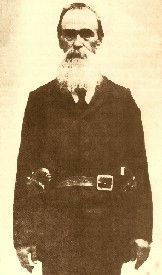 George Maledon earned the moniker of the Prince of Hangmen while serving as Judge Isaac Parker’s chief executioner during the lawless days when Parker served as judge of the Federal Court for the Western District of Arkansas. Born in Germany on June 10, 1830, Maledon migrated with his parents to Detroit, Michigan when he was still a child. When he grew up, he headed westward where he worked as a Fort Smith, Arkansas police officer. When the Civil War broke out, he enlisted in the Arkansas Light Artillery, serving in its 1st Battalion. Maledon, a diminutive man standing at just about five and a half feet, was described as a “whispy” little fellow, with dark eyes and hair, a fair complexion and a long beard. Quiet in nature, he rarely smiled and was almost always dressed in black, an “appearance” that would soon seem appropriate to his new profession. 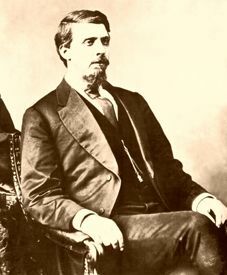 After the war, Maledon returned to Fort Smith where he worked as a deputy sheriff before being hired as a turnkey at the federal jail in May, 1871. The next year, he was appointed as a “special deputy” in charge of execution of the condemned prisoners. For the next 22 years, he would execute more than sixty criminals and was forced to shoot five prisoners during escape attempts, two of which were killed. In no time, he was given the title of the “Prince of the Hangmen” by the local newspaper – the Fort Smith Elevator, who was only too happy to publish each and every morbid detail of Maledon’s handiwork for the “entertainment” of its readers. On September 3, 1875, the largest group ever to be executed at once occurred when Maledon hanged six men. The schedule event had been widely publicized in the media and a week before the execution was to occur, the city began to fill up with strangers from all over the country. Reporters from Little Rock, St. Louis and Kansas City flocked to Fort Smith, as well as newspapermen who traveled far from eastern and northern cities to catch the “scoop.” By the time the event was to take place, more than 5,000 people watched as the six men were marched from the jail to the gallows. Of the six felons, three were white, two were Native American and one was black. Seated along the back of the gallows, their death warrants were read to them and each was asked if they had any last words. When the preliminaries were over, the six were lined up on the scaffold while executioner George Maledon adjusted the nooses around their necks. The trap was sprung all six died at once at the end of the ropes. Other newspapers around the country reported the event a day later. These press reports shocked people throughout the nation. “Cool Destruction of Six Human Lives by Legal Process” screamed the headlines. However, there was one man who was morbidly attracted to Maledon’s occupation – Heck Thomas. One one occasion while Thomas was at Fort Smith, he was asking Maledon for all the particulars when the executioner proudly displayed a collection of leg irons, straps, and ropes that were actually utilized in some of the hangings. When showing Thomas one rope, that had been used in eleven hangings, Maledon commented “It is made of the finest hemp fiber, hand made in St. Louis and treated to keep it from slipping”. But for the curious onlookers, these public events would be short-lived. In 1878, a 16 foot tall fence was built around the gallows and the executions became “private affairs,” usually having less than 50 spectators. The only execution that Maledon refused to carry out was that of Sheppard Busby, a U.S. Deputy Marshal, who had been convicted of killing another marshal by the name of Barney Conneley, when Busby tried to arrest Conneley for adultery. Maledon, who had had many associations with Busby in the past, refused to carry out his duty in this one instance, and the execution was performed by Deputy G. S. White. After more than two decades carrying out these gruesome tasks, Maledon retired from the federal court in 1894 and opened a grocery business in Fort Smith. But he was yet to face one of his most difficult life situations, when the next year his eighteen year old daughter, Annie, was murdered by Frank Carver. Annie met Carver in Fort Smith while he was in Fort Smith being tried on whiskey charges. The two soon began a short love affair which led to her following him to Muskogee, Oklahoma where the young girl was surprised to find that Carver was already married to an Indian woman. When the two entered into a heated argument on March 25, 1885, a drunken Carver shot the girl. Seriously wounded, she was taken back to Fort Smith, where she died three weeks later, on May 17th. Judge Isaac Parker. Click for prints, downloads and products. Finding himself before Judge Isaac Parker, Carver was found guilty of murder and sentenced to hang. However, Carver hired a fancy lawyer, who soon appealed the case to the Supreme Court, and the sentence was changed to life in prison. George Maledon was so disgusted by the decision that he left Fort Smith and took a “show” on the road where he displayed relics from hangings, including ropes, pieces of the gallows’ beam, and photographs of some of the nation’s most notorious outlaws. Setting up a tent in various cities, hundreds of people flocked to the show to hear Maledon speak and view the gruesome displays. By 1905, Maledon’s health was seriously failing and he entered an old soldiers home in Humboldt, Tennessee, where he spent the remainder of his days. Though some sources say he died June 5, 1911, just shy of his 81th birthday, according to government records and other reliable sources, Maledon died on May 6, 1911, and was buried at the Johnson City Cemetery. Maledon has the dubious honor of having executed more men than any other executioner in U.S. history. The final execution in Fort Smith occurred on July 30, 1896. Eleven and a half months later, the original gallows was demolished and the debris completely burned. However, a new gallows was reconstructed at the original site in 1981, as part of the Fort Smith National Historic Site. The site also includes the barracks, courthouse, commissary, and jail building, and a visitor’s center that focuses both on Fort Smith’s military history, as well as the years that it served as the federal court. © Kathy Weiser/Legends of America, updated December, 2017.